I am extremely happy to announce another major first for earthbag building. Precision Engineering has generously provided drawings and specifications for building earthbag structures in seismic areas to meet code. The documents have been combined into one 6-page PDF and are now available online. 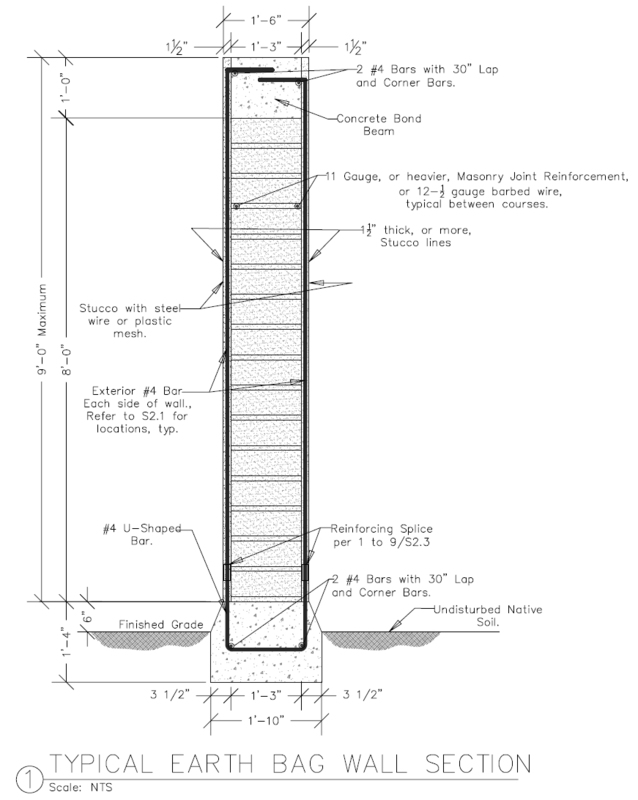 Reinforced Earthbag Specifications is a 6-page PDF describing in drawings and text exactly how one might construct a reinforced earthbag wall that would pass most building codes in areas of high seismic risk. This document was prepared specifically at the request of Dr. Owen Geiger and Kelly Hart for use on reconstruction projects in Haiti, but it could be useful wherever reinforced vertical wall structures may be built. We want to acknowledge and thank Nabil Taha of Precision Engineering for his patience and diligence in preparing this document. I want to emphasize what an amazing gift this is to the earthbag building community, and to those struggling in stricken areas such as Haiti. As far as I know, this is the first time an engineer has published their drawings and specifications in this manner. It’s truly a pioneering document. There is no big industry driving this movement that can pay for tests that costs hundreds of thousands of dollars, and so we rely on expert advice to take earthbag building into mainstream use. I’m sure all my questions could be answered by searching the web… please forgive my laziness. That’s okay because these are good questions and haven’t been discussed yet. So are the reinforcing bars are encased by the stucco? How often are the vertical bars used along the wall? Has any one built with these designs yet? If so is there any problem with the render cracking and exposing the reo bars? What about at the joint at the footing? Also is there problems with moisture transfer during wetter seasons? Are you relying on a membrane on the exterior to keep the wall dry? The vertical spacing will be calculated by PSE Inc. engineers. It depends on the height of the structure, length between wall supports, shape of house, seismic risk, number of door and window openings, and so on. The rebar is encased in thick stucco. There shouldn’t be any moisture concerns with properly sized overhangs. There’s no membrane. The only way the plaster would crack is in an earthquake or possibly faulty plaster work. The first house is now in the planning stages. I’m so glad to see this kind of information in the public domain. I would be interested to hear your thoughts about the effectiveness circular or even domed earthbag buildings. Round and curved structures are inherently stronger, no doubt about it. I am very glad for this document! I think strait walled EB structures need this type of reinforcement to be structurally stable during a seismic event. I wonder why there are no specs for buttressing though. It seems like in impoverished places, well built buttressing is the most simple low cost method for adding strength in an earthbag wall. I know that a document such is this cannot be a one size fits all, but I have a sense that buttressing is an integral part of building safely. Thanks Nabil for your work!